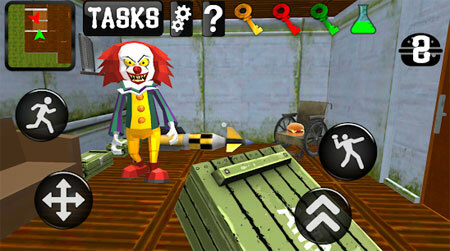 IT Neighbor Clown Revenge is a cool arcade game developed by Spectacular Games. A few years after you had dealt with the terrible neighbor clown, you returned to your city. It turned out that he not only survived, but also built a house even more than the previous one. Get into his new huge house and say hello to him as before. You decided to get into its house and find out what happened. Explore the huge house without getting caught. Hide from the neighbor and reveal his terrible secret. At first, you have to enter into the amazingly huge house, and then to accomplish various investigating missions of this thriller. Try to find the information about this scary it character. Find the key to his terrible secret. One fine day you discovered some changes in the behavior of your old friend who lives next door. You learned that he is associated with a hospital. You began to suspect that the neighbor is connected with it. If you get stuck in the game, check out the video walkthrough and gameplay for the game. This entry was posted in Android Games, Mobile Games, Walkthrough and tagged IT Neighbor Clown Revenge Cheats, IT Neighbor Clown Revenge Gameplay, IT Neighbor Clown Revenge Guide, IT Neighbor Clown Revenge Strategy, IT Neighbor Clown Revenge Walkthrough by Marvin. Bookmark the permalink.